Romance On The Couch ..
“I am inspired by different thoughts, playfulness and happiness which play in the minds of loving couples. 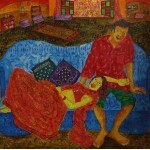 I try to portray the inner feelings which sparkle over the faces of those who are in love. I always use bright and contrasting colors to create a vibrant mood, and even the skin of the figures which I portray, depict designs which have a relationship with the mood that I am trying to capture. My technique is such that I create a pen-like effect with brush. Love is my primary subject, and can be physical, mental or spiritual in nature. I wish to say that there is great joy, happiness and playfulness within a relationship, when the couples are compatible to each other, in all three aspects of body, mind and spirit, and when there is understanding, trust, respect and admiration, from both sides. Lipika Chakraborty ( B. in 1977 in Udampur, Jammu & Kashmir ) – Completed her Masters from an art college in Santiniketan, Bengal. She works and lives in Kolkata.